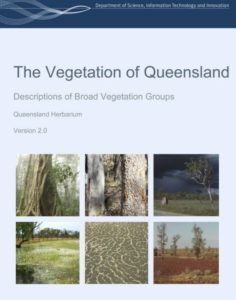 The Vegetation of Queensland: Descriptions of Broad Vegetation Groups provides an overview of vegetation across Queensland, by describing each of 98 Broad Vegetation Groups (BVGs). It is illustrated with 375 photographs, 108 tables and 103 maps. It provides statistics of the pre-clearing and remnant extent of each BVG, and the extent within the protected area estate. It also provides links to where you can get more information about the vegetation of Queensland. The main aim of The Vegetation of Queensland is to concisely describe BVGs of Queensland to enhance their use in government planning, policy and regulation, e.g. vegetation offsets, Bushfire Hazard Area mapping, public education and scientific investigations. You can download a free copy from Queensland Government Publications at www.publications.qld.gov.au/ (search for ‘vegetation’). A complete list of the vegetation communities in each Broad Vegetation Group is also available as a separate spreadsheet from www.qld.gov.au/environment/plants-animals/plants/ecosystems/. To see Regional ecosystem and Broad Vegetation Group maps use the Biota Globe, one of the categories of the Queensland Globe, using Google Earth at www.dnrm.qld.gov.au/mapping-data/queensland-globe.